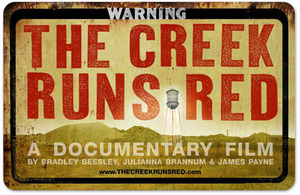 The Creek Runs Red directed by Bradley Beesley, Julianna Brannum and James Payne has a special Earth Day broadcast on PBS' Independent Lens next Tuesday, April 22 at 10:00 p.m. EST. The documentary originally aired on IL last fall and tells the story about the toxic legacy of Pilcher, Oklahoma's lead mining industry. Since being declared a Superfund site in 1981 by the US government, the town's residents have been forced to choose between preserving their hometown legacy for themselves and their children, and deciding to leave for the sake of their health. I love the journey this film takes as it carries us into this sharply divided community to reveal the human cost of this environmental catastrophe. It's incredibly moving and artfully shot by Beesley, Brannum and Payne, the three co-directors. I talked with Julianna as part of my series on female nonfiction filmmakers a few months ago, right before the doc aired the first time on PBS. You can read the interview here. Check local listings in your area and try not to miss this beautiful film. You can also purchase the DVD here and here. but kids are hurt the worst. their future’s now been cursed. PICHER, OKLA. — The ongoing buyout and relocation of families from the Picher Mining Field has led to the creation of a mournful song that reflects the desperation of those who want to leave and the despair of those who have left. The lyrics of the song were written by Sara McCormic, of Bend, Ore. Her connection to the area is a former student, Timothy Kirk, now age 32, who still resides in the Picher area with his 11-year-old son, Timothy. “I met Sara when she was my first-grade teacher at Hugoton, Kan., which is north of the Oklahoma Panhandle. She was good to me,” said Kirk, now age 32. Then one day, McCormic sent Kirk a copy of her song. The song’s lyrics reflect the uncertainty in Picher. The waitin’ leaves us numb. Kirk said he will know where he stands with regard to the buyout when he gets an offer on his home from the Lead-Impacted Communities Relocation Assistance Trust. The lyrics reflect that, too. Will no one speak for us? Will no one make it right? Singer/composer Mark Kershner, of Sisters, Ore., read McCormic’s lyrics and watched “The Creek Runs Red,” a documentary about the Tar Creek Superfund site. He was moved to adapt the lyrics to a song. Copies of the CD, “Mining Memories,” are available from Ed Dollison in Picher by calling (918) 673-1546. The cost is $14.95. The CD is also available by writing to Sara McCormic, 60833 Cobblestone Place, Bend, Ore. 97702. The cost is $14.95, plus $1.50 for handling and postage.